Showtime at Larkin, seen from the cab of 3575: train 455 gets the final cars before resuming the journey to Kamloops. 3575, 3515, 3563, 3550 and 3571 prove that they're hard at work. 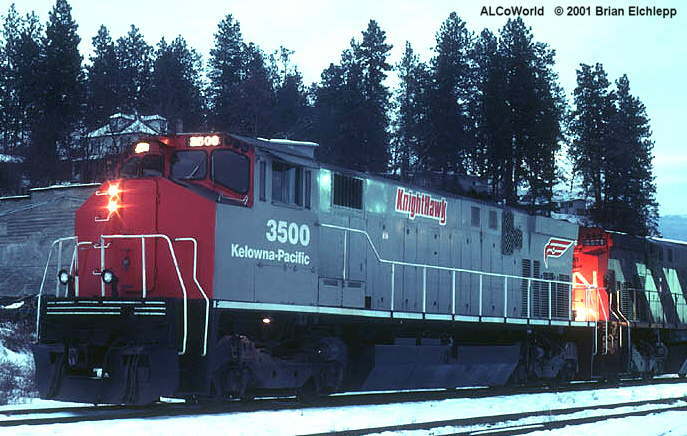 The Kelowna Pacific Railway is a joint venture of KnightHawk Rail, a wholly owned subsidiary of KnightHawk Incorporated, and of New York & Lake Erie Railroad. 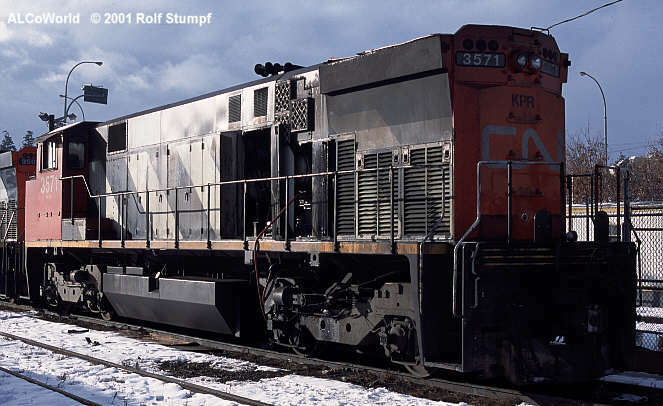 The KPR currently rosters six ex CN M420/HR412 nos. 3500, 3504, 3515, 3563, 3571, 3575 and 3580 (the only HR412 and just for parts). On Aug 14th 2000 the 3500 was finished as the first repainted unit. The 3563, 3571 and 3575 are excellent barkers. The locomotives are kept near downtown Vernon (almost next to the Okanagan Spring Brewery...), overhead views are possible from the Hwy 6 overpass. 3575 was transferred from the St. Thomas & Eastern Railroad in 2000. The Trillium Railway logo was crudely painted over. 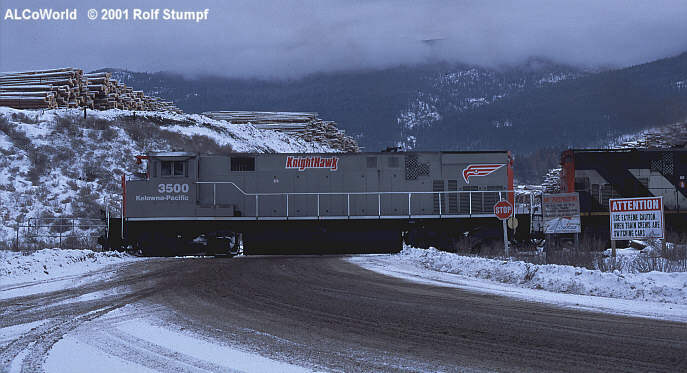 Note, the KPR shares trackage with the Okanagan Valley Railway between Verrnon Jct (conn. with Lumby sub) and Armstrong and on the Lumby sub. Brian Elchlepp reports: The run to Lumby up a 2.2% is terrific. The KPR's run to Kamloops with 4 M420s is amazing. If you get there, don't miss the climb from Vernon to Lumby. Listening to the 12-251C's pouring their guts out to make the climb is simply to awsome for words. Also, you would have to listen to the M's as they switch the lumber mill at Larkin - great work there. Perhaps the ultimate highlight is the Kelowna Pacific's daily (weekdays) run to Kamloops. Four 2,000 HP M420's 45 cars and a 2% grade. The place to be for an Alco fan in the west. 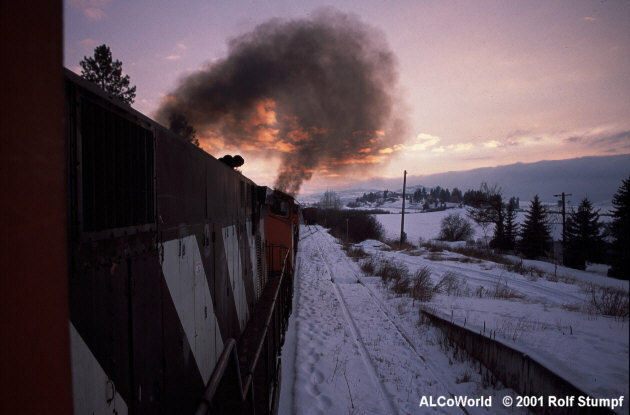 3575 and 3515 were busy at Riverside lumber on January 22nd, 2001 - documented on a well-aged K200. 3571 shows off its tail as it received some attention, incl. 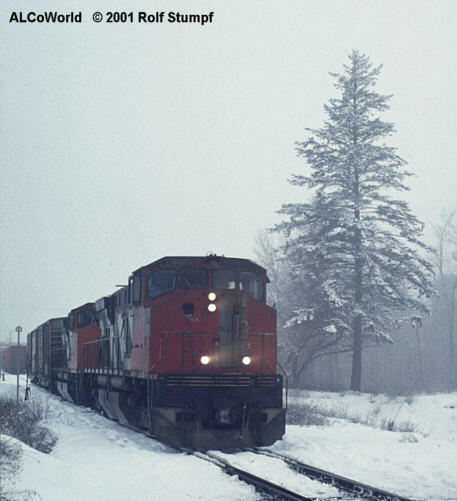 a change of carbody filters, at Vernon, January 22nd, 2001. The KPR has no shed so all work on the units has to be done outside. Though it's the youngest unit on the KPR property, 3580 serves only as a parts source. 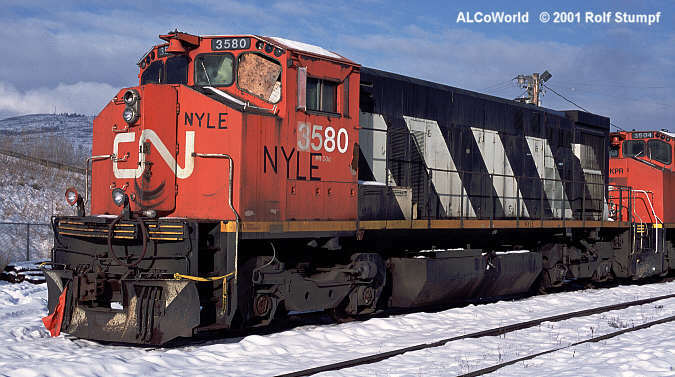 It is owned by the New york & Lake Erie Railroad, note the KPR markings on 3504 instead. Vernon, January 22nd, 2001. January 22nd 2001, about 2 minutes before he released air and went north.